That second one is really cool – I’ve never seen something like that before! The train tracks shot is awesome!!! Where did you take it? What a gorgeous place. I came over to see your SPF pictures, even though I haven’t played for months. 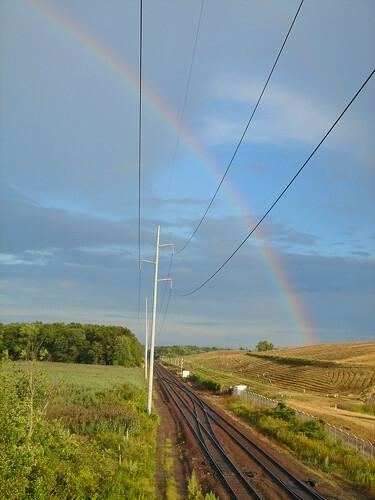 These rainbows are lovely–the one with the railroad tracks makes me a bit homesick for Ohio. I’ve only been in an airplane twice, and both were at night, so the second picture is quite educational for me. A full circle rainbow… HOW COOL! Happy SPF. I played too. 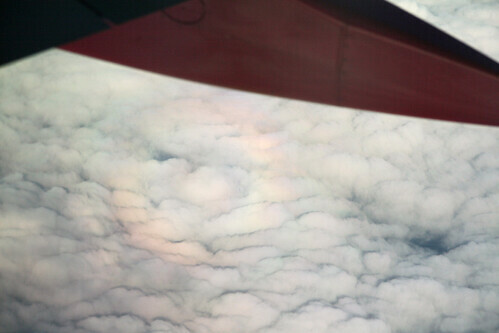 I have never seen a full circle rainbow…that is cool! Wow, both shots are great. I love the texture of the clouds in the second one! Wow, how did you make the second one? Great pictures. Oh, and Harry Potter. I startet to read the first book on 22.07. and in the next hour i will end with the second one. And more follows. I don´t know why i don´t start to read the books earlier. The are so fantastic. And this evening i watch the first two Movies with my brother. Wow, i really like it. And you know what. I am one the person who likes Harry Potter and Lord of the Rings. Are you ready with the last book? Gorgeous pictures, and I am especially in awe of the second one. I didn’t know that there were circle rainbows. This week has been a Harry Potter week for me, because I read Deathly Hallows the first three days and I went to see the Order of the Phoenix today. I think Rainbows bring luck! Love the one in the circle, that’s pretty cool!